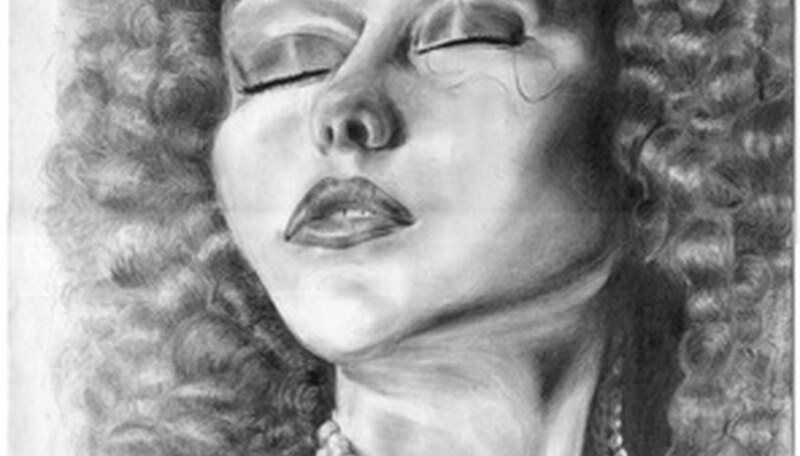 A pencil sketch can serve as the basis for a work of art in another medium. It provides a rough idea of what the finished work will look like and need not be detailed. If graphite pencil is your chosen medium for the finished artwork, however, you can render a sketch in pencil as well, giving it a finished, polished look. Draw an outline of your subject in broad, light strokes. Focus on large shapes and masses and how they relate to one another. If you are drawing a portrait of a person, for example, an imperfectly-shaped oval can serve as the outline of a sketched head. Use your whole arm to give your pencil strokes vibrancy and feeling--but don't press too hard against the paper or your lines will be difficult to erase. If you are using art pencils with different grades of hardness, you should choose harder leads such as "F," "HB" or "H" because they create lighter lines. Fill in details as loosely as you've sketched the large shapes, keeping your whole arm moving. If you have not yet developed an intuitive eye for technical detail, you may want to use a ruler to draw light, straight guidelines that help you keep certain features of the drawing lined up properly. For example, you might sketch two small circles for eyes at the top of a guideline. Indicate dark and medium-toned areas of your drawing with quick cross-hatching lines or scribbles. You may be tempted to press harder with your pencil when roughing in dark areas, but resist the temptation. You want to avoid making indentations in the paper as a general rule, but it's especially important to avoid this in the dark areas. When you render the darker tones, graphite won't be able to penetrate the indentations and the result will be "ghost lines" that will distract the viewer. Add more precise detail, preferably with a darker "B"-lead pencil. Use your sketch as a guideline, but don't be controlled by it. As you study the subject of your drawing you will notice more precise relationships of details--the nose is longer than what you represented in your sketch, for instance, which means your rendering of the mouth will have to be lower. You should still avoid pressing too hard on the paper. Fill the dark areas with graphite, but don't make them too dark. Many pencil artists work in layers to give the finished drawing a soft, natural feel. You might start with quick but gentle cross-hatching lines that become solid shadow as you add layer upon layer. Build up your dark areas. Don't be shy with darks. The power of a pencil drawing lies in the contrast of its dark with its gray and light areas. Be patient and let the darkest areas emerge after you've added gentle layer after gentle layer of pencil strokes to them. Merge dark and gray areas with your blending stump, creating a smooth transition from one shade to the next. While you may press the blending stump more forcefully against the paper than your pencil leads, you don't want to get carried away. The more you rub the paper with the stump, the more you damage the fibers of the paper. Use the blending stump, which you dirtied with the dark areas, to cover the lighter areas with faint shades of graphite. Avoid "dead" space of pure white or uninterrupted black. While you want to avoid accidental "ghost lines" created by pressing the pencil lead to hard against the paper, you can use them to your advantage with a little planning. For example, if you want to suggest fine, loose, individual hairs catching the light against a darker background, "draw" the hairs with the tip of straightened paper clip. When you fill in the dark areas, the "ghost lines" will look like hair. Scott Roberts studied communications at the University of Southern Indiana and has written for local newspapers throughout his adult life. He has created articles for more than 70 international clients. An accomplished artist, he has illustrated and written cartoons for newspapers and GoComics.com. He lives in Southwest Michigan. What Are the Numbers on the Pencils for Shading?